The simple answer is – yes! In the summer, when the temperature outside heats up, your A/C unit has to work harder to keep the temperatures inside your home cool. Why? Your air conditioning system doesn’t actually “cool” the air, but instead it removes heat. During the air conditioning cycle, refrigerant circulates and absorbs heat from inside your home and transfers it outdoors. On those hot summer days your system is under extra stress and has to work overtime to remove the heat from indoors. The hotter it is outside, the more frequently your air conditioner has to run, adding to the wear and tear of your unit. You won’t have to worry about your air conditioning system as long as it’s well maintained. Below are some tips to keep your A/C running all summer long to help you avoid AC repairs! What should you do to maximize your cooling during hot days? Replace dirty air filters. While your air conditioner is already working hard on hot days, a dirty filter will force it to work even harder. Check your filters monthly. Keep blinds/draperies closed during the day. This is a simple way to limit the amount of heat that gets into your home. Blocking out the sun’s rays makes it easier for your A/C to cool your home. Ensure your air vents and registers are open and clear. Your air conditioner is designed to cool a space of a specific square footage. Blocked registers will prevent your system from effectively and efficiently cooling your home. Keep windows and doors shut. Open doors and windows allow cool air to escape and warm air to get in. The warm air you just introduced into your home will create additional work for your air conditioning system. Use fans. Fans can help circulate air and cool the rooms of your home. Mind your outdoor unit! Avoid landscaping with lots of rock or asphalt, which can radiate heat, causing your system to work harder. Keeping your A/C system in the shade will help ease the burden of the summer heat. Also, keep all landscaping at least 2-4ft away from the unit itself to ensure adequate airflow. Schedule annual maintenance. The most important step you can take is make sure you have maintenance performed on your system annually. This will ensure that it is working properly and able to handle those hot summer days. 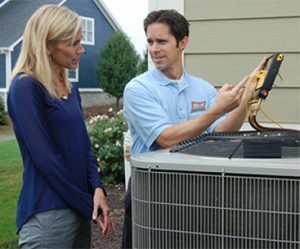 Need AC Service in Utah County or the Salt Lake City Area? Schedule your annual AC maintenance now before this summer heats up!